Garden Sculpture by Guy Bellaver - Mr. Bellaver’s work spans many media, including metal, stone, and wood, as well as mixed media which include metals, glass, and/or fiberglass. His newest work explores these media through kinetics and light. He works in both abstract and representational formats. In addition to over 30 pieces of public art, his work is in private collections around the country and in Europe. 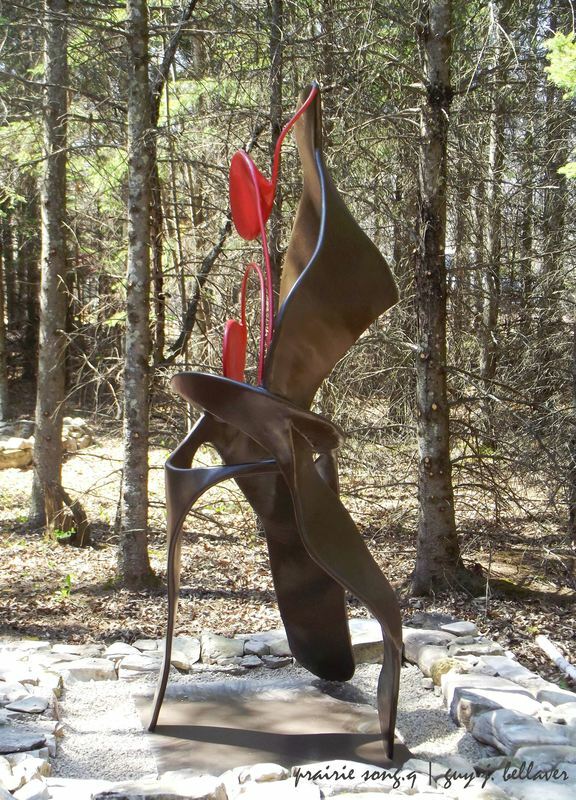 The Ingersoll-Blackwelder home gardens have three sculptures on display from Mr. Bellaver's Quarks Series - Prairie Song.Q, Quarks VI and Quarks VII. Mr. Bellaver installed the art to be enjoyed by the public for the Beverly Art Walk sponsored by the Beverly Arts Alliance and the Open House Chicago. sponsored by the Chicago Architecture Center. The color palette of Quarks VI piece is a bright, joyful blue. 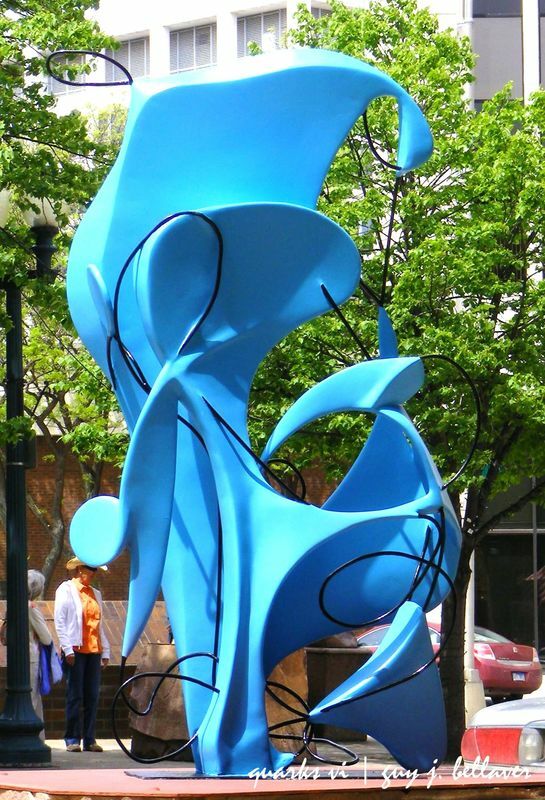 This vibrant color allows the sculpture to clearly differentiate and utilize both its positive and negative spaces, and to add a bold burst of color to the site environment. 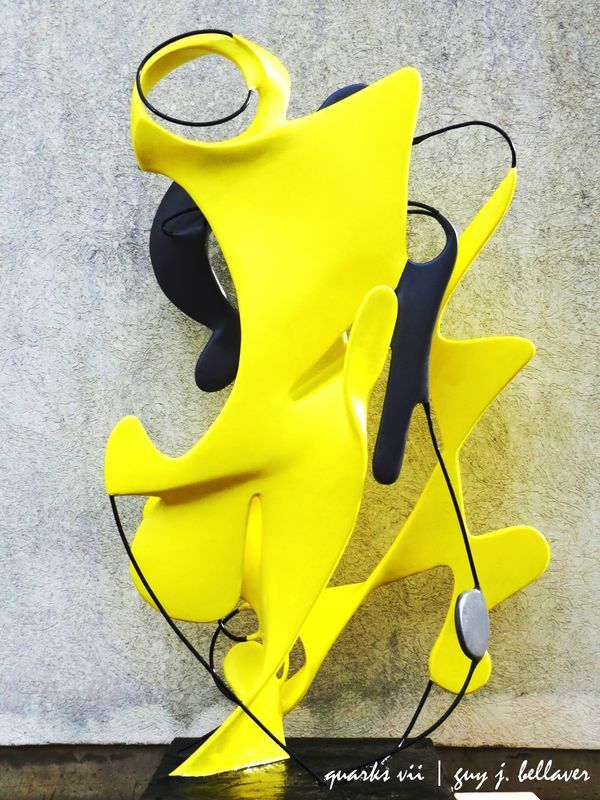 The configuration of the fiberglass sections and the color palette of Quarks VII – the aptly name Sulphur Yellow and Charcoal Gray – are designed to explore shadow and light within the energy masses. Prairie Song.Q is a piece in the Quarks Series, but it is more organic, constructed with less rod and more mass to give the impression of the vastness of the prairie. The mass segments are painted a rich, earth color with red accents – these colors represent the growing and undulating prairie plants, the energy of life on the Prairie, and the explosion of its growth in the spring. More information on Guy Bellaver and his sculptures can be found here.